Someone has a dream, a vision with a purpose, with real drive even in the face of absolute adversity yet still manages to make it a reality. We love folk of that ilk, here at Surf Bunker especially if the idea involves surfing, or making life easier or more pleasant for us to feed our habit. What seems like an eon ago, I had a chat with a man with such a dream as I have described above. Back then his journey was just beginning which seemed at the time to feature an incredible uphill battle through uncharted government hallways and lethargic bureaucracy. I am here to tell you that he won, he did it. Kent Johnson has taken Camp Rockaway from just a drawing to something tangible in less than two years. Why am I so excited about it and why do you need to know? Because, of course you can surf there. You can also live in a tent and socialise around a fire pit and oh, catch a ferry into Wall Street. I know, should the words surf, tent and Wall Street be in the same sentence? This might be the first time it has happened. Anyway, I thought it would a good idea to find out more about this idea became reality. One of the many tent colonies back in the day. Camp Rockaway not only boasts access to waves, golf and a host of other activities, it also has its feet planted firmly on the eco side of the path. Featuring one hundred percent solar powered lighting and electric, controlled showers and more. It is a stone's throw from the city of New York which makes visiting the busiest city in the US a lot more attractive to us wave lovers. Heavily re-developed after Hurricane Sandy came through and destroyed homes, businesses and boardwalks in 2012, Rockaway has a surf culture like no other. Heavily community driven and a sense of ‘togetherness’ within the collective there, Rockaway is now home to surfboard shapers like Paul Surf and establishments like Rockaway Beach Surf Club which help cement the area's credibility for waves. Indeed, there was another who saw it for what it was, Duke Kahanamoku visited in 1912 and bodysurfed some waves (being without a board), sparking intrigue in our revered pastime. Now boasting a brand new pristine boardwalk that can take you the length of the peninsula and access to the city by boat or train, Rockaway is back. We wanted to find out everything about the new camp which has been up and running all summer, so we contacted the man with the original dream. We had a chat with Kent Johnson to get some of the finer details. SB: Hey Kent, what kind of swell does the camp beach get, and what is the best time of year to visit for waves? Kent: We really count on hurricane swell in the late summer and through the fall, and nor-easter swell in the winter. We close on November 1st, so it's best to target late summer and fall if you want to sleep right off the beach and take advantage of multi-day swell events. SB: How long does it take to get into Manhattan and what is the best way? Kent: The NYC Ferry to Wall St. is the only way to go, although the subway and the bus will get you there. The ferry is relatively new, costs the same as the subway, and the ride is awesome - you pass Coney Island, go under the Verrazano Bridge and steam right into the harbor with incredible views of Brooklyn and downtown Manhattan. SB: The tents look amazing, how are they equipped and arranged? 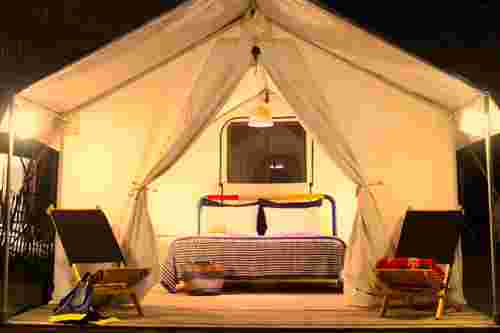 Kent: The tents are 10'x12' safari-style units with front and back porches. Each one comes fully-furnished with a queen bed, linens, towels, extra blankets, a foot locker for your valuables, and lounge chairs and hammocks. We have a big communal tent with picnic tables, a solar charging station, water, a bulletin board, games, and a few years of Surfer's Journals. There are other quiet little areas with palapas and hammocks for hanging out, reading, or napping. There's a fire pit with a grill, and we encourage guests to bring their own food. There's usually a bunch of people gathered around the fire, eating and swapping stories about the day's adventures. SB: Besides surfing what else is there to do? Kent: You name it. If you're still thirsty for water-based recreation there's kayaking, jet skiing, stand up paddle boarding, sailing, and whale watching. If you want nature, there are some great hikes through nearby Fort Tilden or the Jamaica Bay Wildlife Refuge - both are part of the Gateway National Recreation Area. We have a few bike share pilots going on in Rockaway, so you can bike into town to some awesome restaurants and bars, the surf museum, yoga studios, shopping, etc. And there's always live music in Rockaway. We keep our finger on the pulse and can make recommendations. SB: Can we hire surfboards or have lessons nearby if we want? The site at Camp Rockaway, just a short boat ride from Wall Street. SB: Did you come across any massive difficulties in setting the camp up on the current site? Kent: The real challenge where we are now is that the bathhouse - a landmark structure built right on the ocean in the 1930s - hasn't been utilized in 30 years, so the National Park Service has their own challenges re-activating it. However, this summer, once we really hit our stride, we saw how bright a future this stretch of Rockaway Beach has. SB: Is Camp Rockaway going to stay where it is for the foreseeable future? Kent: We hope to be in this location for at least one more season, but the long term goal is to set up a few miles down the beach in a more secluded, natural spot. SB: What would say is the camps biggest selling point? Kent: Listening to the waves at night. The beach gets so quiet at night. You go for a walk out there, look out at the ships on the horizon, and it's just so hard to believe you're only a few miles from Times Square. It's surreal. SB: With Kent and the team at Camp Rockaway having made this dream a reality, they continue to improve and refine their unique project but keeping true to their quest of peace and tranquility. A view of the old bathhouse from a hammock. If you are on a city break, surf trip or live in the city and just want to escape the hustle and bustle, Camp Rockaway has to be worth checking out. A beachfront location, being lulled to sleep by the sound of waves crashing through just a wall of canvas whilst being in the busiest city in the US. Come on, you have to be just a little bit curious? It's nightime in the city of New York and you are listening to waves and living in a tent.